From the author of Little Women comes a collection of gothic, romantic, and spellbinding tales guaranteed to surprise and delight. This collection represents the best of Alcott's adult oeuvre. The stories in this volume display dramatic intensity and thrilling, suspenseful plots that show Alcott to be a complex and passionate writer. Listeners will discover within this maelstrom of murder, deceit, obsessive desire, treachery, duplicity, and betrayal that love and honor can still conquer all. 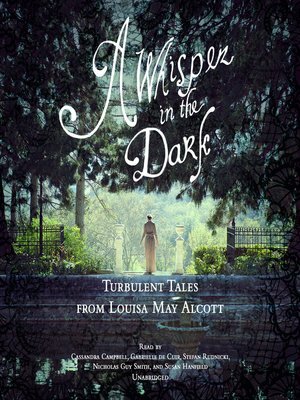 The book takes its title from the tale "A Whisper in the Dark," arguably Alcott's gothic masterpiece, a story of imperiled innocence. Also featured are "The Mysterious Key and What It Opened," "The Abbot's Ghost; or, Maurice Treherne's Temptation: A Christmas Story," "La Jeune; or, Actress and Woman," "Ariel: A Legend of the Lighthouse," and "The Skeleton in the Closet."